Like all our foods, our new grain-free foods offer excellent, balanced nutrition. Rather than relying on grain content, these natural formulas do have carbohydrates such as peas, potatoes and a selection of healthy vegetables in the grain-free dog food. Ideal for all life stages, our newest nutritious foods provide another great option for pet parents who want the best for their dogs and cats. For detailed information about these products, including ingredients, guaranteed analyses and more, visit our site at lifesabundance.com today. My pet suffered from continual scratching. Blood testing revealed a specific count allergen reaction measure >4,300 to grain mites. We switched to a grain free diet and his condition improved significantly. Research revealed that grain mites exist in a lot of foods. E.G.,in 21% of cereals sold for human consumption. So in our case, the allergen wasn't in the food itself but in the mites existent in the product. We froze, as recommended, the to be used dog foods for a while. We subsequently discontinued doing that and the scratching remained mostly gone. I can't wait to share this article. It's comprehensive information on grains in pet food that all pet parents can benefit from and will help them make an educated decision that is best for them and their pet. Your the best Dr. Jane! Thank you, Dr. Jane, for the great explanation as to how our carbs are processed in our dog and cat foods. I know you do any exceptional job of making sure you have the best holistic ingredients to give our pets a healthy food source. Virgil and I appreciate having this option to offer to both dog and cat parents. We haven’t needed grain-free yet for our own animals, but I can tell you that our greyhounds LOVE the new grain-free dog food. We bought some samples, and I ended up accidentally cutting one of them open. Our dogs simply hoovered those kibbles up off the floor! Of course we already use all the Life’s Abundance treats, but I’m convinced that we could use the grain-free food as an additional, VERY inexpensive treat for our dogs! Great explanation of grains in pet food. I see so much confusion on this issue. Love having both options. My dalmatian loves the new grain free food, but he loves everything Life's Abundance so I'm not surprised!! Thank you Dr. Jane!! Thanks for adding another great product to our already stellar lineup!!! Thank you for this very informative and well-referenced article, Dr. Jane. There are so many myths about grains and grain-free, that it's nice to have the actual science and facts. I will continue to use the All Stage food, but may order some of the Grain-Free just to try. My dogs have had ZERO skin irritation issues since switching to Life's Abundance food, treats and shampoo. Still, for those who need it, I am glad we can now offer a grain-free pet food alternative. The most sensible and valid discussion on grain free I've ever read! Want to thank you so much Dr. Jane, for the All Stage, it's increased our cat's health overall, very impressive! Always believed grain-free was the only way to go before Life's Abundance came into our lives, but now we understand the true crux of the matter simply through the positive changes in our beloved cats. The All Stage will always be our mainstay but now we and our clients have another incredible formula, Grain Free, to better fit the needs of all of our bundles of love! Great information and article that really explains the difference between the grains, food allergies and our beloved pets. I know there is a lot of confusion out there and this article explains everything so nicely. "FDA investigating link between grain-free diet and heart disease in dogs. RALEIGH, N.C. — The Food and Drug Administration is investigating a link between grain-free diets and heart disease in dogs, a trend noticed by North Carolina State University's College of Veterinary Medicine. Boutique diets for pets are all the rage to pamper pups, but new information seems to reveal that a grain-free diet isn't the very best for dogs, and may turn out to be downright disaster. 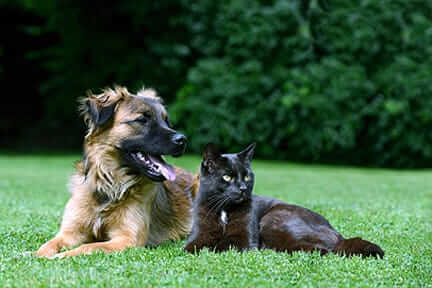 "It's unnecessary for your dog to be on a grain-free diet," said Dr. Ariel Robelen. NC State's College of Veterinary Medicine noticed a disturbing trend. Breeds of dogs that previously had no predisposition to heart disease were developing heart disease. And the constant - each of those dogs was on a grain-free diet. "They become lethargic, they may stop eating, their activity will drop, exercise and tolerance, so the signs can overlap with people who have heart disease, but it's not the same physiologically as a heart attack," said Dr. Steve Marks. Michael Wilson brought his dog, Arrow, to see the doctors at NC State who saw the cardiomyopathy, changed his diet and reversed Arrow's trajectory. "I started to notice he was really lethargic and didn't want to play," Wilson said. Marks said if it were his dog, "I would probably change to a commercially balanced diet, and I would get off the grain-free diet." The FDA announced they are investigating the link between grain-free diets, heavy in peas, potatoes and lentils, with heart disease, and NC State's cardiologists and nutritionists are working together to come up with more answers. Thank you for taking the time to address my concern...I am at ease concerning this issue. Could you please tell me the amount of Taurine per cup serving? We're so pleased! And we're happy to help. Our Grain-Free dog food formula contains a guaranteed minimum amount of 0.15% Taurine per standard measuring cup. All of our nutritional information is included on the individual product pages on our main site (just click the header at the top of this page). Hello, this is a great article and some good, recent replies! Thank you all! As a recent customer of the NC State Vet School for my cat, they referred to this article and said we should take our cats off your grain-free food OR have the food analyzed to get the amount of Taurine. Well, no need to get it analyzed because you have the guaranteed minimum analysis already posted on your website! However, all of this begs the question of the optimal amount of Taurine needed per cup. Is there a standard minimum? (Again, for me specifically, this question is related to cats.) I see your grain-free cat food has 0.20%. Some other products are double this amount, so just wondering. Thank you!